This frozen dessert can double as a cocktail, cool you down when you’re ready to melt, and totally impress your guests. It's simple to prepare, and requires only 4 ingredients and can be made up to 3 days in advance. Top the granité with your favorite summer berries and a sprig of mint for a pretty presentation. 1. Combine 2 pints of raspberries, the sugar, and ¼ cup of water in a medium saucepan. Bring to a boil over medium-high heat, stirring to dissolve the sugar. Transfer the mixture to a blender or food processor and process until smooth. 3. 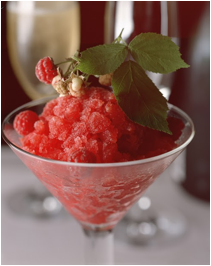 Using the tip of a spoon or the tines of a fork, scrape the granité into chilled dessert glasses, garnish with the remaining ½ pint raspberries and the blueberries, and serve immediately. Recipes appears courtesy of Francois Payard.